KowCast Ep 32 – Shop Talk: Secret Empire vs Metal vs Legacy and Convention Dealer Update – Kow Cast! Your Kowabunga Comics Podcast. 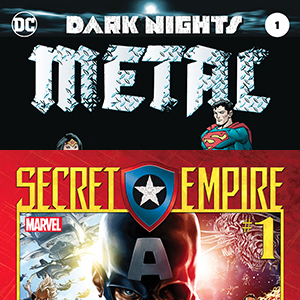 Eric and James return with a new episode to talk about reception of Secret Empire, Metal, and Legacy. Which books are selling well in the shop, why is it, and what do we have to look forward to? Additionally, we have received some questions about what we take to local comic shows, and how the whole dealer/vendor thing works. Join us, as we break down some of the pieces to how we attend shows, what type of stock we carry, and a few tricks for prepping and dealing! KowCast Ep 33 – Shop Talk: Back Issue Sales Favorites and New vs Unused Characters!